One of the most important parts of your garage are its springs - whether they are torsion or extension, these hardworking components are designed to operate day in, day out, bearing the heavy load of your door. If your door springs fail, your door will become unusable. Dealing with a failed garage door is a headache for any household, and especially for those that use their door several times a day. It’s essential to guard against total failure and breakdown - the best way to do this is to repair and replace them before they break. Over time, heavily used springs will begin to degrade and wear down. Some tell-tale signs that they are suffering from spring fatigue can be a wobbly, weak or noisy door. If you notice these symptoms, it’s essential that you get one of our garage specialists to inspect and assess the condition of your unit as soon as possible. Springs retain an enormous amount of energy, and when they fail this tension gets released all in one go. When this component fails, it can be extremely dangerous for anyone in the vicinity. We strongly recommend that no homeowner tries to repair their own springs – stay safe and have a trained professional deal with the problem! 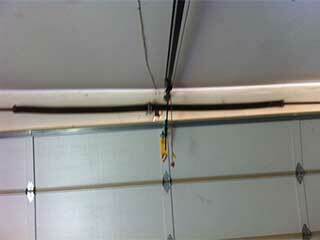 Door springs are designed to last a long time, but only have a finite lifespan. When they fail, most will have been in place for several years, meaning homeowners stand to benefit from the increased durability, reliability and corrosion resistance of a more modern replacement. When replacing your springs it’s important to remember that an upgrade here would be an investment that will help prevent further problems from arising any time in the near future. If your garage is showing any signs of weakening or failing springs, or if they have already broken, talk to our professionals at Garage Door Repair Jupiter as soon as possible. We'll arrange for a trained technician to attend your property and ensure your problem is resolved as quickly as possible.